The son of portrait painter Hans van Asch who did not join the Guild, Pieter became a small-scale landscape painter in the manner of Jan van Goyen and Salomon van Ruysdael. he did not make many as he had to take care of his parents. His paintings are found in many Delft inventories from 1630 onwards. One of his sunny, backlit landscapes is seen in the background of the Kenwood House Vermeer. 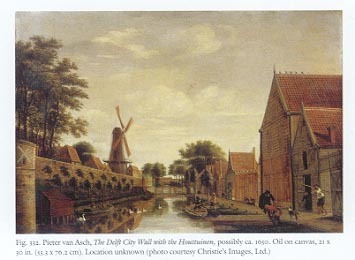 Baker Van Buyten who had contacts with Vermeer family owned three Van Asch works (according to the inventory taken 1701). He lived in the Choorstraat in 1655, paying a rent of 108 guilders; later in Doelenstraat where he died in 1678. In 1669 the town of Delft paid him 100 guilders for a painting above a mantlepiece in the Prinsenhof building. To the right: a mezzotint engraving by Jan Verkolje, showing a portrait of his fellow artist Pieter Jansz van Asch / van Nas. A comparable image in oils is in the Amsterdam Rijksmuseum. 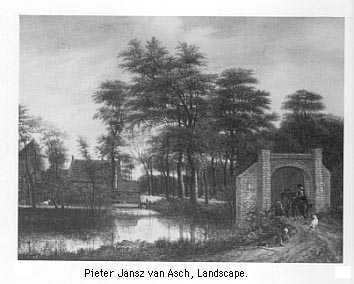 Below are two landscapes by Van Asch. Note. Six of his still lifes were in the collection of Arent van Straten, 1651. Saur, 1992, I, p. 381. Soutendam, Necrologium p. 12 mentions Doelstraat. Pieter van Asch, 15 July 1668 (NA 1870), rented a house on Doelstraet for 54 f. per year; private communication by Montias, 2000. Year of birth given as 1602 in Montias 1981, p. 200 and in De stad Delft, exh cat. 1981, II, ill. 205. Death year erroneous in exh. Cat. Delftse schilders p. 34. The 1669 painting in Montias 1980, p. 185, table 7.1. 108 guilders in Montias 1982, p. 125. See discussions in exh.cat. 'Vermeer and the Delft School', Metropolitan Museum of Art, New York City, 2001, p. 86. Wheelock, Vermeer & the Art of Painting 1995, pages 5-6 discusses his collection. Arnold Houbraken, De groote Schouburgh der Nederlantsche Konstschilders en Schilderessen, The Hague 1752 [2nd ed.] Book 1, page 235. Bottom: Portrait of Van Asch by Verkolje. Launched 16 February 2005; Last update March 1, 2017. More info in the RKD site.